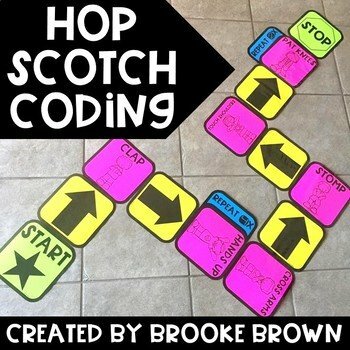 Hop Scotch Coding provides a simple, interactive introduction to unplugged, block-style coding that is perfect for Kindergarten through third graders as they learn the basics of programming. After completing activities such as these, they can apply similar block coding strategies to coding websites and apps for kids and eventually to more advanced languages of coding. In groups of 3-4, students will build a sequence of code on the floor together. Each student will then take turns walking through the sequence of code and following the instructions all the way from START to STOP. A sequencing arrow means to advance forward and a movement card signals an action that the student must do. A looping mat can be placed behind a movement mat for students to repeat the action a given number of times.